Lowry has won a PGA Tour card for the rest of the season. IT WASN’T THE fairytale final round for Shane Lowry at Chambers Bay last night, but his joint best finish at a Major tournament has had a big impact on the rest of his season. Lowry finished the tournament on level par in a tie for ninth, and although he couldn’t quite make a play at the leaders, it was enough to move him back into the world’s top 50, as well as earning him a temporary PGA tour card for the rest of the season. 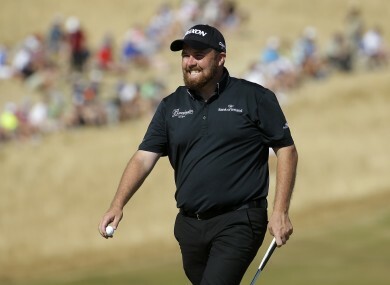 Lowry, who wore black on all four days at the US Open in memory of the Irish students killed in Berkely last week, jumped from 57 to 45 in the rankings, moving back to within five spots of his highest ever ranking. By doing so, he leapfrogging countryman Graeme McDowell, who has plummeted from 15 to 48 since the end of 2014. However, McDowell’s fall is nothing compared to that of Tiger Woods, who’s career crisis continues. After his rounds of 80 and 76 last week, he’s now continued his rapid drop down the world rankings to 205, his worst ever position. Woods started 2015 as the world number 32, but has hurtled down the ladder after the worst form of his career since he returned from a back injury. Elsewhere there was plenty of movement in the top 10, as Dustijn Johnson moved from 7 to 3 in the world after coming agonisingly close to winning, while Jodan Spieth closed Rory McIlroy’s lead at the top further after his heroics last night. Padraig Harrington drops two places, but ranking of 92 still signifies a major improvement in his form this season. Email “Shane Lowry back in world top 50, as Tiger falls again to worst ever ranking”. Feedback on “Shane Lowry back in world top 50, as Tiger falls again to worst ever ranking”.